Qatar’s Nasser Saleh al-Attiyah (right) talks to Overdrive Racing’s Jean-Marc Fortin. Al-Attiyah will be partnered by French navigator Matthieu Baumel in a Toyota Hilux, which also sports the 2022 FIFA World Cup Qatar logo (below). The Manateq Qatar Cross-Country Rally gets underway with a spectacular starting ceremony at Souq Al-Medina on The Pearl-Qatar from 18.30hrs Thursday. Drivers and co-drivers from 19 countries will then tackle five punishing selective sections through the Qatar deserts from tomorrow to Tuesday (February 21-26) on this opening round of the 2019 FIA World Cup for Cross-Country Rallies, being organised by the Qatar Motor and Motorcycle Federation (QMMF). 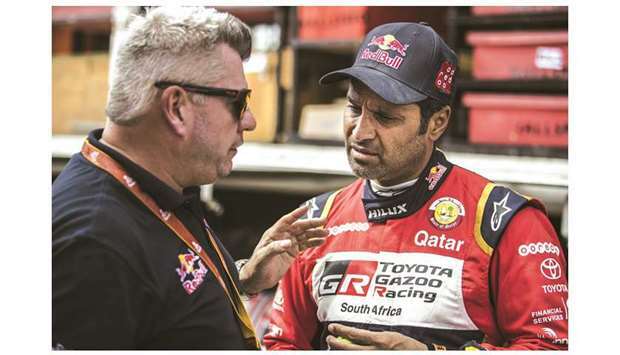 Qatar’s hopes of victory rest firmly on the shoulders of the three-time Dakar Rally winner Nasser Saleh al-Attiyah and his French navigator Matthieu Baumel. Al-Attiyah will be chasing a sixth victory in his home round of the FIA World Cup in the first of three Toyota Hiluxes entered by Overdrive Racing. Dutchman Bernhard Ten Brinke and Saudi Arabia’s Yazeed al-Rajhi drive the second and third V8-engined cars that were designed in South Africa and are run by the Belgium-based team. Poland’s top seed and last year’s event winner Jakub Przygonski is the defending FIA World Cup winner and will be one of a handful of drivers who will attend a pre-event press conference at Souq Al-Medina on The Pearl-Qatar prior to the start. Przygonski drives the first of two X-raid MINIs in the event, with Saudi Arabia’s Yasir Seaidan driving the second car, and hoping to improve on last year’s third place. 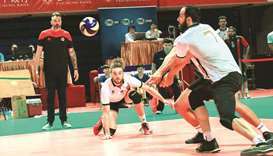 Equipment and team personnel began to arrive at the service park, adjacent to the Lusail Sports Arena, on Monday and Tuesday, with the majority of the equipment in situ by yesterday morning. Fresh from finishing second overall in last weekend’s Baja Russia Northern Forest Rally through the snowy tree-lined wastelands of the Republic of Karelia, Vladimir Vasilyev has entered the Qatar event in a BMW X3 CC with his regular navigator Konstantin Zhiltsov. The Russian finished second in Qatar in 2018. The experienced Czech Miroslav Zapletal was also in Russia last weekend and will be looking to improve on the fifth place that one of his Ford F-150 Evo cars achieved in Qatar in the hands of former WRC star Martin Prokop in 2018. The T3 category has been expanded in 2019 and new technical passports have been given to derivatives of the Can-Am Maverick X3, Polaris RZR 1000 and the Yamaha YZX 1000 R. Already an extremely popular category at the Dakar Rally – where teams compete in a Side-by-Side (SxS) section, 13 teams have entered the FIA opener in Qatar. Brazilian Reinaldo Varela has been to Qatar before with the South Racing team and he wheels out a Monster Energy Can-Am on this occasion and tops a group that includes Adel Abdulla and Ahmed al-Kuwari from Qatar, Romania’s Claudiu Barbu, Russian Fedor Vorobyev and Oman’s Abdullah al-Zubair. Camelia Liparoti is the only female on the entry list and drives a rented Yamaha YZX 1000R in the T3 section. A veteran of several Dakar rallies on a quad, the Yamaha Europe employee actually trained in the Sealine area of Qatar before January’s Dakar event and really enjoyed the terrain. 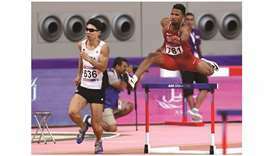 The result of the T2 category for series production cross-country vehicles will be fought out between the Qatari duo of Mohamed al-Meer and Mohamed al-Harqan, and Saudi Arabia’s Abdulla Najeeb al-Baker. There will also be a series of three national events running in conjunction with the FIA event. 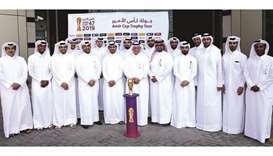 National competitors will take part on the first, third and fifth days of the event with a full opening day and two partial days counting as rounds four, five and six of the Qatar National Baja Championship. Drivers on the unofficial list for the National Baja rounds include Lebanon’s defending MERC 3 champion Henry Kahy, Kuwait’s Salem al-Dhafeeri and the likes of Jamal Fakhroo, Ahmed Allouh, Hussain Mahdi, Nicolas Pacheco, Jahman Jaralla and Jamal Allouh. Several drivers registered for the FIA event will also score points in the National Championship.